For both Polyboard and StairDesigner, the free/demo version (it's all the same thing) has the same functionality as the full version except for manufacturing output. You can design and optimise your projects, control feasibility and show off your projects in 3D but you cannot print or export cutting lists, plans and manufacturing files. You can buy the software which comes with this functionality integrated, but you don't have to. See the FAQ 'How do I get manufacturing documents from Polyboard and StairDesigner?' for your options. You can download the demo versions of OptiCut, OptiNest and CalepiLight to test out all the functionality. They will output optimized files but these will not include all the information required for manufacturing. Please request a sample cutting list or nesting output to test in your workshop. Once you have designed your project with the free version of Polyboard or StairDesigner you have 2 ways to get the cutting lists and plans to build your project. If you make furniture or stairs regularly you can buy a full version of our software. We will send you an activation code for your existing free version that gives you access to all functionality. Rest assured, you will be able to continue working on your projects without loosing any data. Just upload your design file from the free version of the software to the forum and we’ll send you back all the documents to manufacture your project. These services are free of charge to Premium Support subscribers, so you'll also get access to expert advice to help you with the design and build. These services are are great for the occasional project where it doesn't really make sense to buy the software. Click here for more information on our CabinetFile and StairFile services. Our software can work in any units including feet and inches. Open the software and go to Tools > Units to make the change. The video is for Polyboard but the same options are available for StairDesigner, OptiCut and OptiNest as well. If you are using the free version of the software there’s no need to activate it, just open up your software and start designing your project. If you have bought the full version send us your User Code and we’ll send you back an Activation Code. The user code takes the form of an encrypted text file. 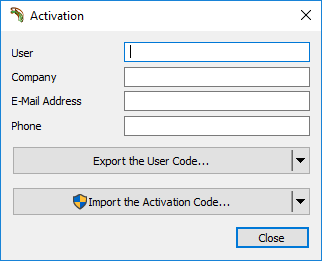 First fill in your contact details, then export the user code, email it to us, then finally import the activation code file we send back which will activate your software. Instead of an encrypted file you will need to send us a 16 digit user code which can be accessed from the same menu location. We will send you back a 16 digit activation code to copy and paste into your software and unlock your paid features. …quit the software and instead of left clicking the launch icon, right click on it. 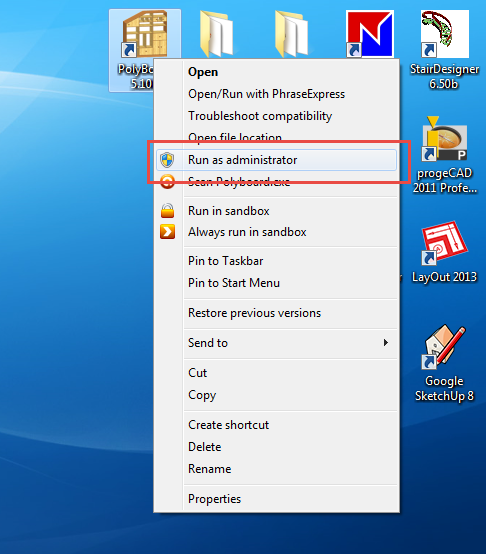 In the mouse menu choose ‘Run as administrator’, and follow the same steps as above. Note for Mac users: as you'll be running the software in a Windows emulator, you may not be able to right click your mouse. Click here for a good article on the Parallels website (an emulator software manufacturer) that tells you how to do it. Polyboard & StairDesigner - Windows 7, 8, 10 or higher and 2 GB RAM, although we recommend 4 GB. OptiCut & OptiNest - Windows XP Pro, Vista, Windows 7, 8, 10 or higher and 2 GB RAM, although we recommend 4 GB. Mac: we have many Mac clients successfully using our software with a Windows Emulator. See the next FAQ for details. If you want several people working on Polyboard you can install the free version on as many computers as you want. The free version will enable you to do everything except output the manufacturing documents...plans, cutting lists, CNC etc. When you have finished a design on the free version just open the project in the fully activated version and you will be able to output the manufacturing documents. This means you are able to continue using the software on any computer from anywhere. You can design on a laptop with a customer and take the design to the full version and print the working documents. You can even give away the free version to customers to see your project and even design for themselves. Then take their files and process them to build the projects. If you do need fully activated versions on more than one computer, additional licences are discounted 50%. You can purchase additional licences discounted 50%. StairDesigner, Polyboard, Opticut and OptiNest do not have a Mac version. To run the software on a Mac we recommend you use a Windows emulator. Several of our customers use VMWare Fusion which you can try. We have also received good reports on Parallels run in Coherence Mode. In addition, you will need Boot Camp installed which is normally pre-installed on Macs. Another solution is to buy a second hand PC just for design software. You can find a Windows PC that will run the software perfectly very cheaply on eBay. Ness himself has a second hand computer that he bought for around £50, just for design and manufacturing in the workshop. This computer runs all his CAD programs and avoids his main computer collecting wood chips and dust in the workshop. If you need to move your software to another computer, it is important you follow this procedure to get a new Activation Code. You must first uninstall your software from the old computer. Important! Do not uninstall the software as you normally would with Windows. You will not get the code you need that way and will not be able to get it later either. Instead, navigate to and click on the Uninstall.exe file which uninstalls the software and extracts the code we need. You should find it on your hard drive under 'Program Files/Boole & Partners/Polyboard (version number)' for Polyboard for example. Please send us the Uninstallation Code and also the User Code of the free version of the software installed on the new computer. Once we have both of these codes, we will be able to generate a new Activation Code for you. Sometimes your browser, most notably Internet Explorer, will strip out the file extension of some downloads. This can happen in particular with .exe files which we use for installing our software. If a message pops up asking you what programme or application to use to open your software download, this is probably because the file extension has been removed. To solve the problem, find the file you've downloaded, right click on it and select 'Rename'. Then add '.exe' to the end of the file name shown. You should now be able to double click on the file to start the installation process. Some anti virus software, notably Norton, stops .exe files being downloaded so you cannot install your software. You can revise your anti virus settings to accept the files, or turn it off temporarily during the download. You can download the latest versions of our software from the Navigation Bar at the top of the website, then click on Download and select the software you'd like to install. You can order and pay for full versions of the software directly from this website. Please navigate to our Online Store. You can also contact us to request our bank details and send us a bank transfer or cheque. Once we have received your payment we will ask you for the user code of your free version of the software, which you can download from our Members Area. With the user code we will calculate your activation code according to the version you have bought. Inserting the activation code into your free version will activate the functionality you have paid for. If you upgrade to another version we’ll send you another activation code to unlock the extra functionality. In this way you only pay for the functionality you need, never loose any data and continue working seamlessly from version to version. Intermediary versions, for example v5.0, v5.01, v5.01a, v5.01b, are free. Updates between major versions, for example v4 to v5 to v6, are optional and cost 30% of the full version. Upgrades to higher versions of Polyboard (e.g. Pro to Pro PP), StairDesigner, OptiCut, OptiNest and CalepiLight are free for 30 days following your purchase. After 30 days you will pay the price of the new version with a discount equal to 70% of the price you paid for your current version. After we receive your payment we’ll send you a new activation code that will upgrade your software and free up the new functionality. No, there are no ongoing fees. All purchases of our software come with 6 months Premium Support free of charge. We also offer a 1-2-1 training service. Please click here for more information. Polyboard and StairDesigner have a save and restore feature. Saving your settings exports a composite file including all the required data (excluding icons and toolbars) for a complete restoration. These settings include your libraries and manufacturing methods, your textures, post processor settings, print and label settings and more. We recommend saving all your settings on a regular basis, along with your model libraries (not part of this process). However, use discretion when deciding which settings to restore. For example you may not want to overwrite a new version of the Quick Design libraries with your old ones. If you modify our standard Quick Design libraries, we also recommend you save the main libraries folder with a new name. This will ensure it does not get overwritten if you load new libraries from our website. It is also possible to move library elements into a new library. You may want to do this is you have your own customised library set up, but want to add new items from the latest version we release. Please see our videos tutorials or ask on the forum for advice if required. No, Polyboard and StairDesigner only allow basic design of parts for a quick 3D view. To add more complex details you must export and edit the stair as a 3D DXF file to a CAD program. 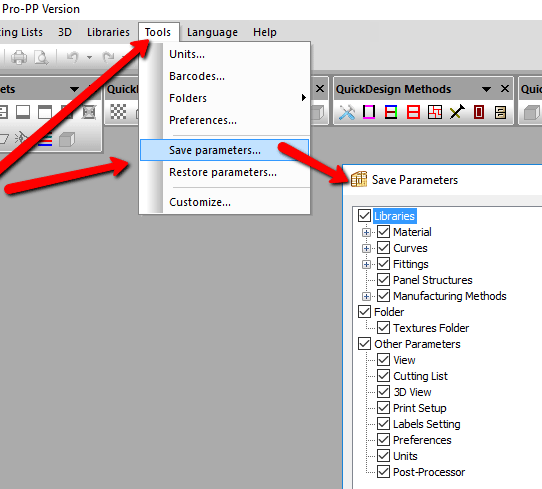 Selected paid versions of the software have the 3D DXF export functionality built in. Alternatively Premium Support subscribers can use our cut list processing services to obtain these files. We have lots of example cabinets, furniture and stairs available for downloading from our Quick Design Libraries, and we’re adding new resources all the time. Yes. We recommend our OptiCut software, but you can export your cutting list in CSV format and then import into a spreadsheet and a large range of optimising packages. Polyboard Pro PP outputs post processors files for MRP (woodWOP, HOMAG machines), CID and CIX (BiesseWorks and bSolid for Biesse machines), XXL (Xilog Plus and Xilog Mastro for SCM / Morbidelli machines), TCN (TpaCAD for Felder, Vitap, Brema), HOP (NC-HOPS for Holz-her etc) and DXF files for any standard CNC or CAD/CAM software. StairDesigner Pro DXF outputs DXF files and so will work with virtually any CAM software and CNC machine. StairDesigner Pro PP outputs post processors files for MRP (woodWOP, HOMAG machines), CID and CIX (BiesseWorks and bSolid for Biesse machines) and TCN (TpaCAD for Felder, Vitap, Brema) and DXF files for any standard CNC or CAD/CAM software. OptiNest outputs DXF files and so will work with virtually any CAM software and CNC machine. OptiCut comes with a large range of CNC saw post processors. You can load the machine code into your machine interface and see quickly if your machine is compatible with the code. Please note that our post processors will need to be set up with the right tool paths and options to correctly cut your parts. This element is not necessarily set up correctly in the example code. The code is just to see if your machine interface will read the output. Polyboard and StairDesigner will connect to any nesting machine via our OptiNest software. They will also integrate directly into some nesting packages. Please contact us for more details. Go to the log in page and enter your username and password. Hover to the far right of the grey bar at the very top of the browser window, where it says ‘Howdy, your name’. The last option on the dialogue box that pops up allows you to log out. When logged in, click on the far right of the grey bar at the very top of the browser window, where it says ‘Howdy, your username’. This opens up your profile. After you’ve made your changes, click ‘Update Profile’ at the bottom of the page. To return to the homepage of the site, click on ‘Wood Designer’ on the left of the grey bar at the top. Click on the ‘Lost your password’ link at the bottom of the login page. If you see this message, ‘Sorry! You do not have access to this content’ you are probably trying to view content that isn’t associated with your subscription level. Please click here to upgrade to Premium Support. Alternatively, your Premium Support subscription may have been cancelled in error by PayPal. Please see the ‘Cancellation in error’ section on this page for more details. If you are already registered or if you’ve cancelled your subscription in the past, then try to re-register as a new member, you may get an error message stopping you from registering. To avoid this, sign up again as an existing subscriber when completing the registration form, using the username and password from your original subscription. Any problems, just let us know and we'll get you up and running again very quickly. Simply log in to your PayPal account and cancel your subscription with Wood Designer. We will automatically be notified of this by PayPal and your access to your Premium Support benefits will stop at the end of your payment period. Please contact us to say you'd like to cancel your Free subscription, and we'll get that done for you. If you are unable to access your Premium Support benefits, this might be because your monthly subscription payment didn’t go through with PayPal, normally because the credit card associated with the subscription expired, or you changed your bank details. Please check with PayPal if this is the case, and re-register for the subscription level you were on. Important: to reactivate your expired user profile, re-register as an existing subscriber using the username and password from your expired subscription. Don't hesitate to contact us if you would like us to check everything is up and running ok. If you have any queries or problems, please don’t hesitate to contact us.